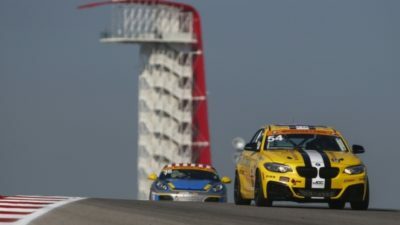 AUSTIN, TX, May 4, 2017 – American paralyzed BMW driver Michael Johnson & JDC Miller Motorsports will race in the Advance Auto Parts Sportscar Showdown at the Circuit Of The Americas in Texas for the Continental 150 this Fri., May 5. The track marks the first return course for Johnson after making a switch to sportscar racing beginning in 2016. The Advance Auto Parts Sportscar Showdown opens with practice on Thurs., May 4 at 12:40 p.m. with an additional practice session later in the afternoon to close out the day. Qualifications will take place on Fri., May 5 at 11:15 a.m., followed by the two-hour and forty minute race at 2:45 p.m. (all times Central). Johnson and Simpson are behind the wheel of the #54 BMW in the Street Turner (ST) class. The BMW is specially designed with hand controls for braking, shifting gears and manipulating the throttle, to accommodate Johnson being paralyzed from the mid-chest down.